A lot of companies around the world are having trouble protecting their data, if a vendor-sponsored survey of 2,200 IT decision makers in 18 countries a vendor is accurate. According to the Global Data Protection Index survey released Thursday by Dell EMC, 27 per cent of respondents said their firms had suffered “irreparable data loss” in the previous 12 months. By comparison in the last survey two years ago only 14 per cent of respondents said they had lost data. Of the 100 Canadians questioned this time around 16 per cent said their firm had suffered irreparable data loss. “If you don’t have the right investment in the right data protection systems we’ve seen a big increase in the inability to recover data from current data protection methods or products,” Ruya Atac-Barrett, Dell EMC’s vice-president of marketing for data protection products, said in an interview. Companies surveyed had at least 250 employees. Two hundred respondents answered questions in the U.S., the U.K., France and Germany; while 100 respondents replied in each of Canada, Mexico, Brazil, South Africa, UAE, Italy, Switzerland, Netherlands, Australia, Japan, China, South Korea, India and Singapore. Arguably, to perhaps no one’s surprise, 76 per cent of all respondents (72 per cent of Canadians surveyed) said they had experienced a data disruption in the previous 12 months. The reasons included irreparable data loss, but the number one reason was unplanned downtime (41 per cent), followed by ransomware (28 per cent). Drilling deeper the top two biggest reasons for disruptions were hardware (36 per cent) and software (35 per cent) failures. They were followed by data corruption (30 per cent), external data breach (28 per cent), loss of power (27 per cent) and accidental user error (23 per cent). Other reasons listed after that included loss of backup power, a mistake by a service/cloud provider and employee sabotage. Perhaps for these reasons only 33 per cent of all respondents were very confident their organization could fully recover from a disruption to meet business obligations. Only 37 per cent were very confident their organization is meeting its backup and recovery service level obligations. Only 35 per cent were very confident their data protection infrastructure meets regulatory compliance. Only 35 per cent said they were very confident their organization could reliably recover all business-critical data if hit with a destructive cyber attack. Ballooning costs of storing and managing backup copies due to rapid data growth ranked first at (ranked 1stglobally). 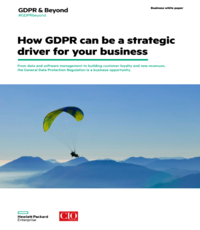 In most cases, the report concludes, organizations need to improve their data protection infrastructure – the majority of respondents highlight at least one area that could be improved or that they do not have confidence in.